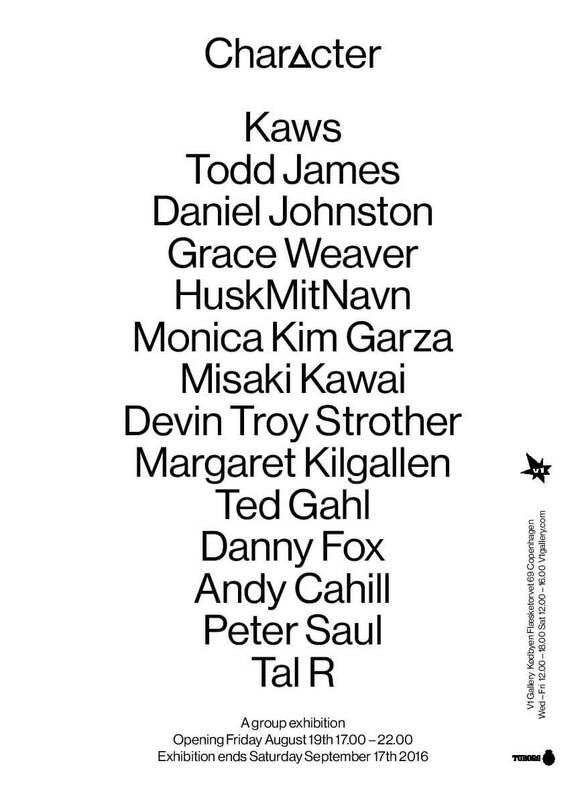 Kaws, Todd James, Daniel Johnston, Grace Weaver, HuskMitNavn, Monica Kim Garza, Misaki Kawai, Devin Troy Strother, Margaret Kilgallen, Ted Gahl, Danny Fox, Andy Cahill, Peter Saul and Tal R.
It is a pleasure to present Character – an exploration of artists with a strong and independent visual identity that all deploy an idiosyncratic character or characteristic in their oeuvre. The exhibition is a celebration of character in practice and work. At the same evening we present our brand new sister gallery, Eighteen, located in our backyard, Slagtehusgade 18. Inaugural reception of The Believer and Eighteen – Friday August 19 from 17.00 – 21.00. Exhibition period Character: August 20 – September 17. Exhibition period Wes Lang The Believer: August 20 – October 1.